A few weeks ago I attended an Art Trade Show hosted by the Clackamas County Arts Alliance. Even though none of the displays grabbed my eye, I couldn’t escape the siren’s call to wander through their little shop of art supplies. 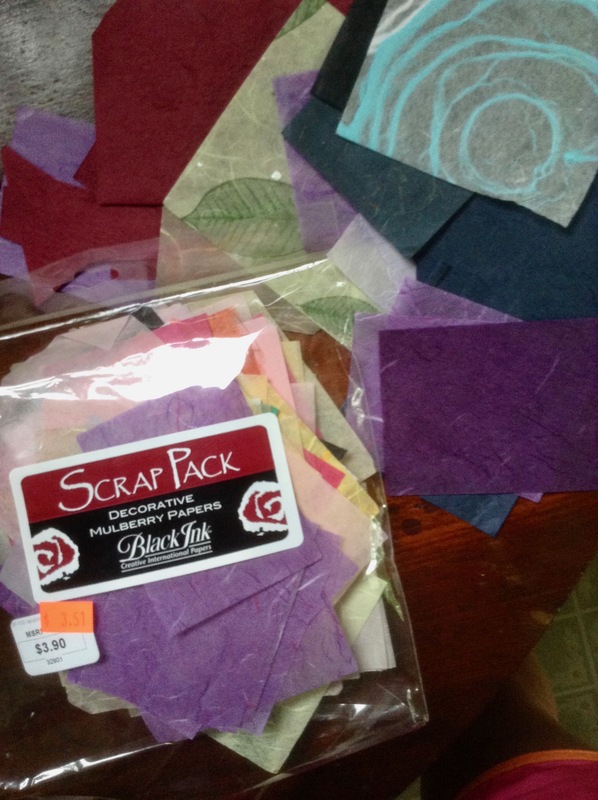 I managed to resist many tempting treats, but somehow a pack of mulberry paper scraps kept calling to the few dollars I had in my pocket. A handy pack of temptation and inspiration! I’ve never worked with mulberry paper before and, to tell the truth, had no idea what I would do with it other than to open it up and organize all the little scraps by color (yes, my spice rack is alphabetized and my bookshelves are sorted by subject and author). As I was sorting, little blips of inspiration were lighting up in my head. 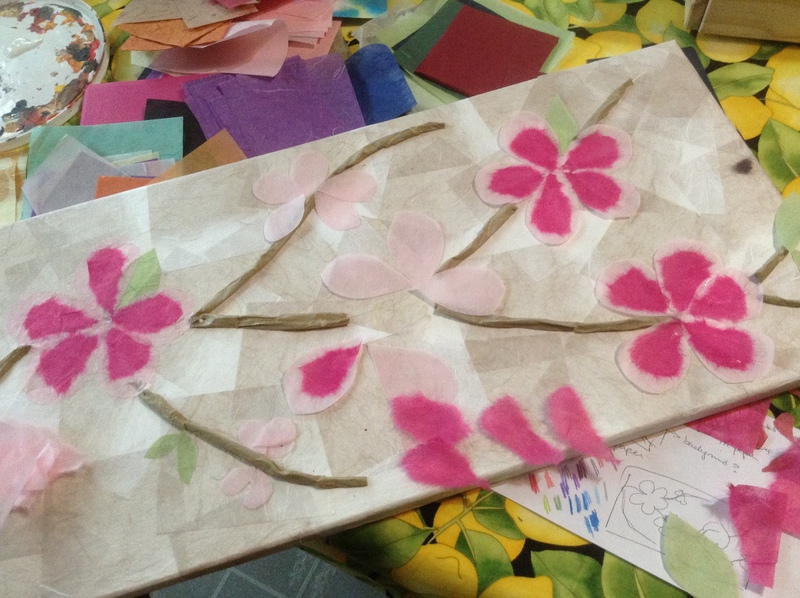 One of those blips, inspired by a pile of pink scraps, were some flower blossoms. I quickly grabbed a piece of note paper and made a rough sketch…which turned into four more sketches and an itch to get started with a new technique and material. In my stash of art supplies are several 10″ x20″ stretched canvases my mom brought me that ended up not being the best surfaces for painting (hence why they were stashed in my closet going unused). However, I figured they would be a perfect support for my latest idea. The first order of business was to to make a background, which simply meant laying down piece after piece of some creamy tan scraps to cover the top and sides of the canvas. I used gesso to get the pieces to “stick” then went over the whole thing with a coat of acrylic gel medium to smooth it out and give it a bit of a shine. 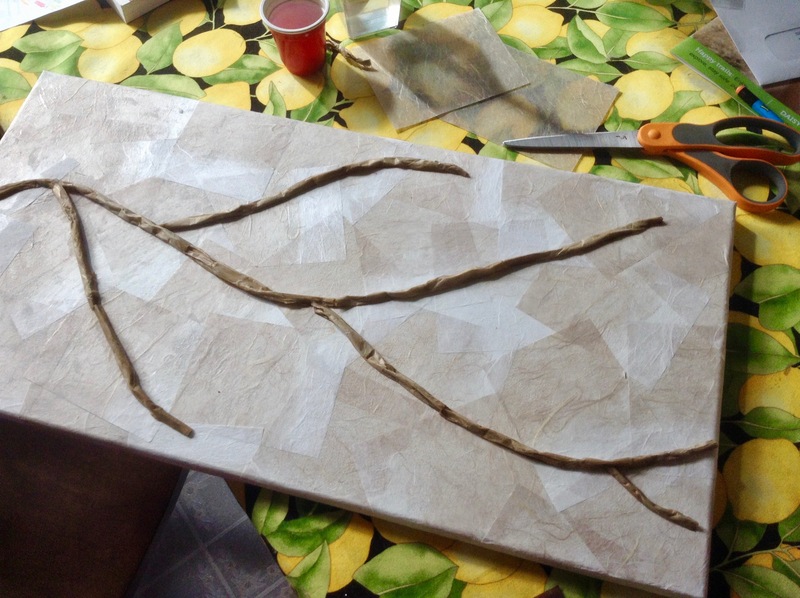 The branches were a fun construction project of rolling brown scraps and gluing them down before they unrolled themselves…this was a little messy to say the least. 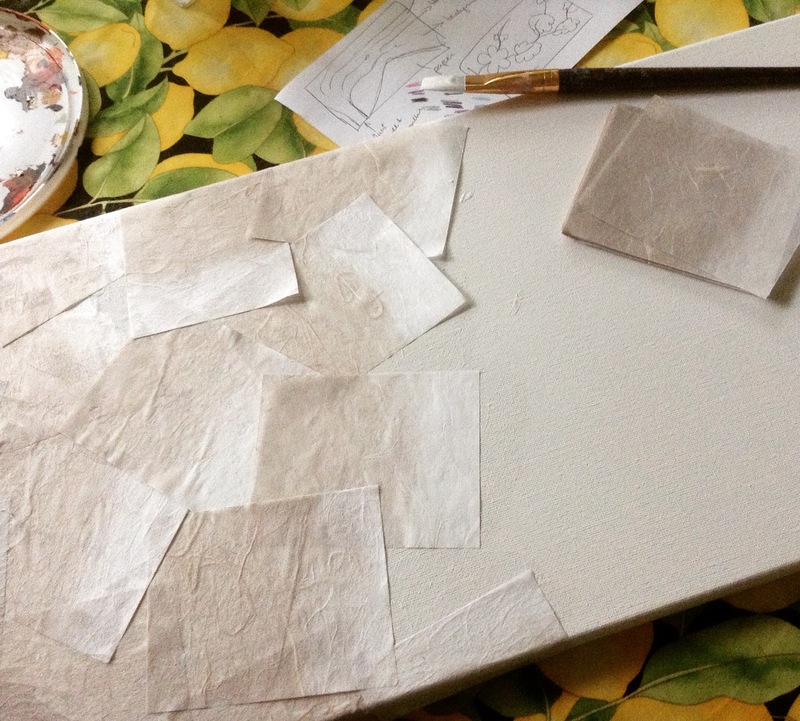 The first thing I had noticed about the mulberry paper was that it feels more like fabric than paper and when torn makes a frilly sort of roughened edge. I thought this would be perfect for petals and set about to tearing my way to a pile of petals with the plan of having a light pink petal layered under a dark pink petal. Well, so much for planning. I wanted them to seem frilly, but the edges of the light pink faded too much into the background. I played around (aka “wasted a lot of time”) trying to figure out how best to do the petals. I ended up cutting out the light pink with scissors to give it a harder edge, then gluing the torn dark pink pieces onto them. Using a brush and glue, I was able to pull the torn edges of the dark pieces to soften the petals. 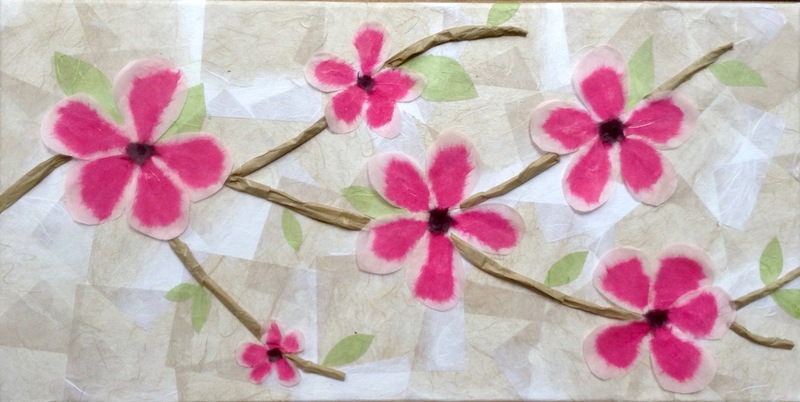 To keep them looking light, I only partially glued the assembled petals onto the canvas, giving them a bit of a blowing-in-the-wind look. The final result was a little messier than I thought, but I was hooked on working with the mulberry paper! 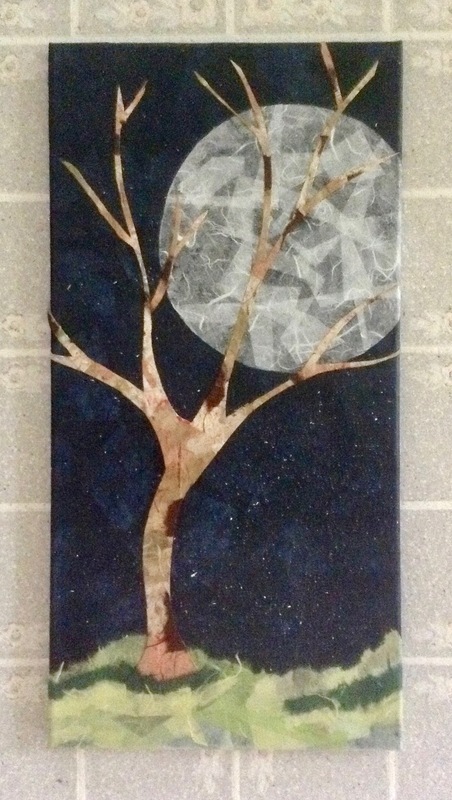 For my second try, I wanted a tree silhouetted against a moon (inspired by my stack of dark blue scraps). 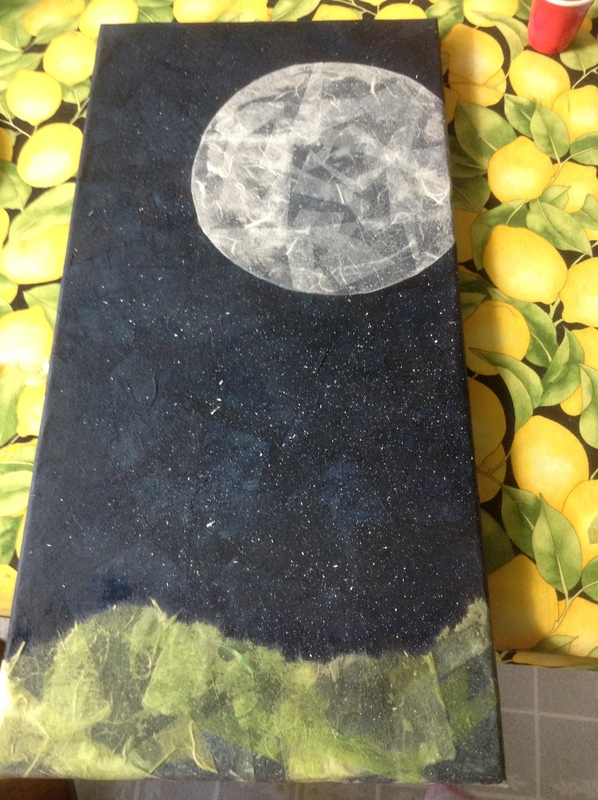 After securing the background, I used a toothbrush to spatter some “stars” onto it. The moon turned out far better than I expected since the thin white scraps over the dark blue give the impression of the moon’s craters. I then slapped on a hill for my tree to perch on. Looks good, but I had no idea how I was going to do the tree. I had first thought of rolling pieces as I did with the branches above, but I wanted more control over the shape of the tree. Playing around, I grabbed a piece of junk mail and started cutting a trunk, then branches to make a template just to get an idea of how I wanted the tree to look. Okay, template in hand, what now? I tried cutting scraps to match the shape of the tree but it proved to be head-bangingly frustrating. I figured, “I really like my template, why not just use it?” So I set about to gluing torn scraps of various browns all over the template. Once dry, I flipped it over, whipped out my handy dandy X-Acto knife and tried away the excess. Voila! All that was left was to glue down the tree, add some “grass” to the base of the tree and give everything a coat of gel medium to finish it off. Apologies for the blur on this. I’m having a great time making these little collages. They’re quick to do and my brain is loving the challenge of “constructing” them. I keep coming up with more ideas and think, with a bit more practice, they’ll be perfect as part of my upcoming show in July. I do have a couple colored pencil pieces in my to-do art queue and will probably work on them while I scour the Internet for a good deal on more scrap packs. How about you? Do new materials inspire you? Working on anything that provides an enjoyable challenge? Great job on the collages! I recently had a challenge making a little (2′ diameter) water wheel. I wanted to make it with 16 buckets but I did not think that would work well as the buckets would not be deep enough. So I had to recut pieces for just 8 buckets, which is a little easier. I would have just started with eight buckets because I like to go the easy route! This looks like so much fun! Can’t wait to see what you create next! Oh cool! I especially like the one with the moon… It’s a long time since I played around with some new materials and I’ve forgotten how fun it can be! All my craft shopping lately has been of the unimpulsive (and uninteresting) need it, buy it, use it variety. Time to fix that, I reckon! Go for it! I don’t normally like shopping, but when it comes to art supplies (and bookstores) I’m always tempted into something new. Now if only there was a More Time store so I could buy a few extra hours to make use of all my temptations. Yes, some entrepreneurial astrophysicist really needs to begin a Kickstarter campaign for the More Time Store.